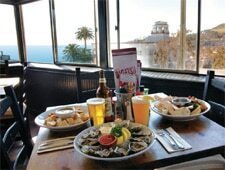 Seafood dishes abound, all served in a lively atmosphere. : This elevated Laguna Beach venue, which occupies the top floor of a two-story structure off Coast Highway, effortlessly spins the kind of laid-back vibe that one might expect given its name. The combination of smart, easy tunes flowing from the jukeboxes, sporting events beamed through strategically mounted TVs, and the airy openness of the building makes it easy to settle in with a frigid brew selected from the impressive list and enjoy the city’s coastal charm. Executive chef Craig Connole, who also helms the kitchen a few blocks down the road at K’ya Bistro, oversees a menu loaded with seafaring delights along with a small list of turf options. Among appetizers, seafood fans will want to dive into the garlic shrimp or the lobster fondue with garlic toast points, while others will gravitate toward the tangy buffalo chicken wings. Lobster and corn chowder is a must-order, either as a soup or a main. Fish lovers have a wealth of winning options to choose from, including swordfish, halibut and ahi. For dessert, a chocolate sauce-drenched brownie with vanilla ice cream is worth sharing.